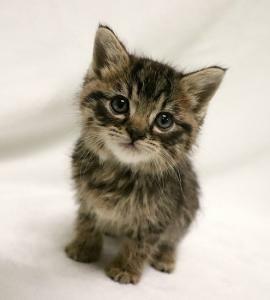 SPY THEMED KITTEN: 2 months old / small Mostly Mutts adoption center is open Mon-Sat. 11-4pm. Some of us are in foster homes so please call 770-272-6888 1st to find out if I’m available to meet during the week. Hi, I’m James Bond – a calm little fellow with a big heart! In fact, My foster mom says I am a real SWEETheart. Though I don’t have a loud purrrrr, I will definitely show my appreciation for all the chin and belly rubs you want to give me. They are my favorite! I love the play yard in my foster home and enjoy sleeping in a pile with my siblings. We do have an arch-nemesis in our foster home – the vacuum! It will send us scattering every time! We have all just started showing interest in toys, but we enjoy playing with each other best. Maybe you would like twice the kitty love and to take one of my siblings home with us? That would be great fun! I’ve started my kitten shots, but you must finish those for me as I grow, I’m microchipped, combo tested negative and I will come with an engraved name tag. I'm not yet neutered due to my small size, but it is required and will be done as soon as I grow a little more. Mostly Mutts will cover that cost with one of their vets, so local adoptions only, please. Gentle children only as I'm very small. My Adoption fee is $175.00. You can adopt me through the Mostly Mutts shelter after you have an approved application.